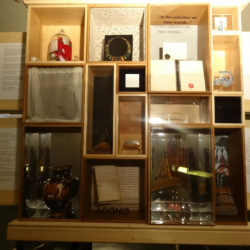 The object must always be displayed behind a secure glass case. The utility of pots is often considered universal: transcending cultural and geographic boundaries. Pottery – considered one of the world’s oldest inventions – dates as far back as the earliest settled communities. However, its contemporaneous continuation tells us a lot about human development. Indeed, it has survived and is flourishing in the present, which speaks to its enduring value, so that today, where we have tended to develop divisions between art and craft (not least in our museums), making pots can be a fine art practice. South African artists like Andile Dyalvane are dominating some of the pioneering contemporary designs of ceramic art coming from Africa – creating a global demand for stoneware from the continent. One can go as far as to say that artists such as Dyalvane use the medium of pottery as literal and figurative vessels for artistically and visually narrating the stories of Africa by Africans, subverting the often anthropological and archaeological reductions of functional objects we have seen in museum collections. Views from the Studio (2011) bulges with tenacious vibrancy: showing an unusual confidence for a ceramic vessel historically consigned to ‘’ethnographic” or “African’’ collections, simply as artifactual rather than as art. But – that is not the case with Dyalvane’s contemporary vessels – his ceramics are critically-acclaimed, so much so that they earn him international residencies. In 2017 Dyalvane had his first U.S. solo exhibition at Friedmand Banda in New York, aptly titling it Camagu (an isiXhosa spiritual mantra giving thanks to both the living and the dead) to acknowledge his successful career. This career has seen him mentor up-and-coming artists and ceramic enthusiasts while making considerable profits through his company and studio Imiso Ceramics, co-owned with fellow artist Zizipho Poswa. More so, his gratitude also acknowledges his cultural significance both internationally and locally as a living artist who is well represented in galleries, museums and international art events all over the world. 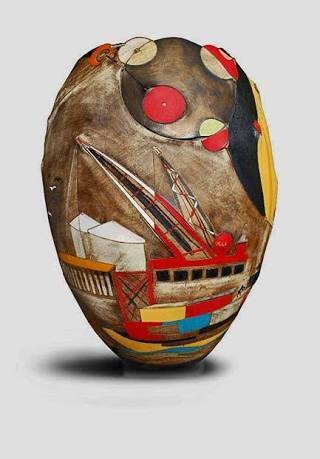 Just as grandiose as the scale of the vessel is, so is its depiction of both Dyalvane’s success and of the exuberant, albeit hotly contested, industrialised area of Woodstock where the artist has been working for a decade in his studio overlooking Table Bay harbour. Yet as much as Views from the Studio is reflective of the artist’s current environment, Dyalvane juxtaposes his new urban reality with his Xhosa traditional roots through the incorporation of uluqaphula (scarification) by incising the vessel’s surface: a trademark signature for many of his artworks. The stoneware vessel, like art, reads as a fascinating (un)intentional spatial documentary of the artist’s booming career trajectory: from his humble beginnings in the small village of Ngobozana, Qobo-qobo, Eastern Cape to a well-travelled international artist who can afford the skyrocketing prices of gentrified Woodstock. Andile Dyalvane’s Gentrified Views: What Does (Ceramic) Art Have to Do with It? Andile Dyalvane’s Views from the Studio (2011) offers both a dynamic outlook of the site where the artist operates – Woodstock, Cape Town – and a testament to the creative successes that have personally and artistically influenced his career. 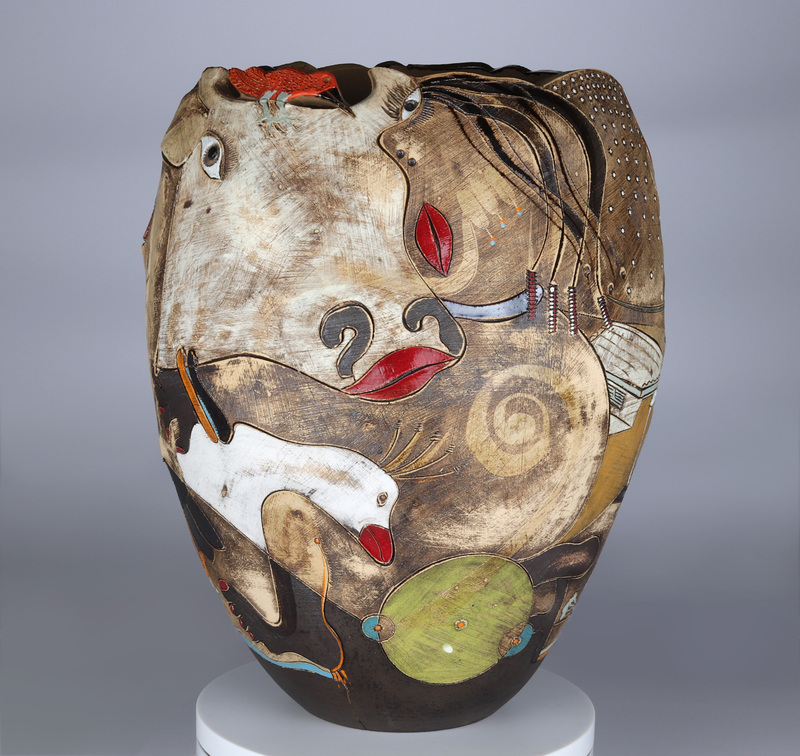 From intertextual Picasso references to the Nguni cow and musical notes that adorn this ceramic, Views from the Studio is an admirable work of art. 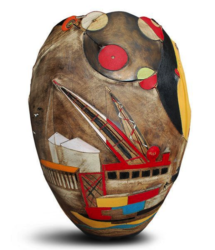 It commands attention, standing beautifully erect with its intricate collage of disparate painted and incised images that reflect the industrial environment of Woodstock, where Dyalvane has worked in a studio apartment overlooking Table Bay harbour for the past decade. Figure 1: Views from the Studio (2011). Andile Dyalvane. Photograph by Pinterest/The Pottery Shed. 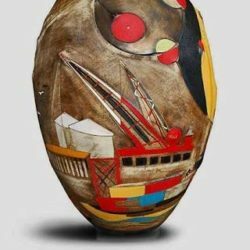 The vessel is richly decorated in vivid colours and figurative snippets of buildings, cranes and a Metrorail train, amongst other things – all symbolic identifiers of the industrial urban environment surrounding the artist’s place of work. Dyalvane’s reflections on his immediate environment are not only observational, however, as he has carved indentions and markings into the clay with found material that he picked up on the streets of Woodstock. Bolts, screws and typewriter keys were used as carving tools to permanently mark the suburb onto the vessel itself. Dyalvane is as reflective about his immediate environment as he is about his Eastern Cape roots, and in Views from the Studio, Dyalvane incorporates leitmotifs from his Xhosa heritage, which includes uluqaphula (scarification), implied in Dyalvane’s trademark incised markings on the vessel. In its juxtaposed imagery, Views from the Studio reads as a fascinating spatial documentary of the artist’s success: from his humble beginnings in the small village of Ngobozana, Qobo-qobo in the Eastern Cape, to a well-travelled international artist who can afford the skyrocketing prices of gentrified Woodstock. The slogan of Imiso Cermaics, Dyalvane’s company, is ‘dawn of a new era’, which speaks to the successful reception his art enjoys, particularly as a Black artist in the context of South Africa’s past, where Black people were on the margins of social equality and justice. Now, in post-apartheid South Africa, in the ‘dawn of a new era’, artists like Dyalvane can enjoy critical acclaim – he has won several international and local awards for his talents. Inasmuch as Dyalvane celebrates and is invested in the ‘dawn of a new era’, both ideologically and from the perspective of progress, he is not afraid to hybridise new urban realities with cultural traditions. Inferences of modernity are juxtaposed with traditional rural life in Views from the Studio. One can even read Dyalvane’s general motifs through reconciliation and the intellectual framework that W. E. B. Du Bois called ‘double consciousness’. 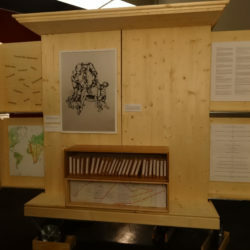 Sparking a conversation (through his artistic practice and his upward social mobility) with his Xhosa traditional background changed it all, ‘when a village elder saw him sketching one day and suggested that he should go to a school that would help him develop his skill’ (Matsinde 2015: 44). In his juxtapositions, Dyalvane suggests that these are not entirely separate worlds, and that there is space for co-existence as culture and tradition evolve. It could be argued that the biggest appeal of his work lies in the liminality of existing between these two realms, realms that can be considered oppositional but are not always so. 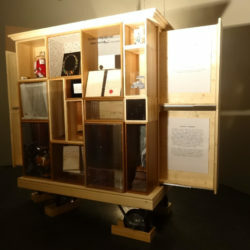 Articulations of the double consciousness become a significant facet of speaking to the agency that allows Dyalvane to seamlessly blend his cultural heritage with a contemporary urban energy that results in unique, handmade pieces. 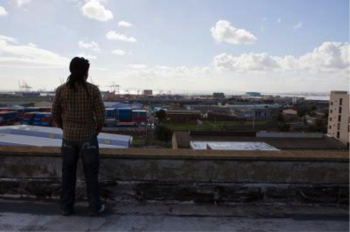 … both the literal and metaphorical view as he interprets the less popular view of the Cape Town city skyline. Inspired by the daily view of the harbour and industrial areas, passing trains and moving cranes and storage containers from his studio, [he] provides the world a detailed account of what his eye is fed as he floats in his creative zone. Figure 2: Screenshot of Imiso Ceramics: Views from the Studio Collection, inspired by the artist’s views from his Woodstock studio. Imiso Ceramics. 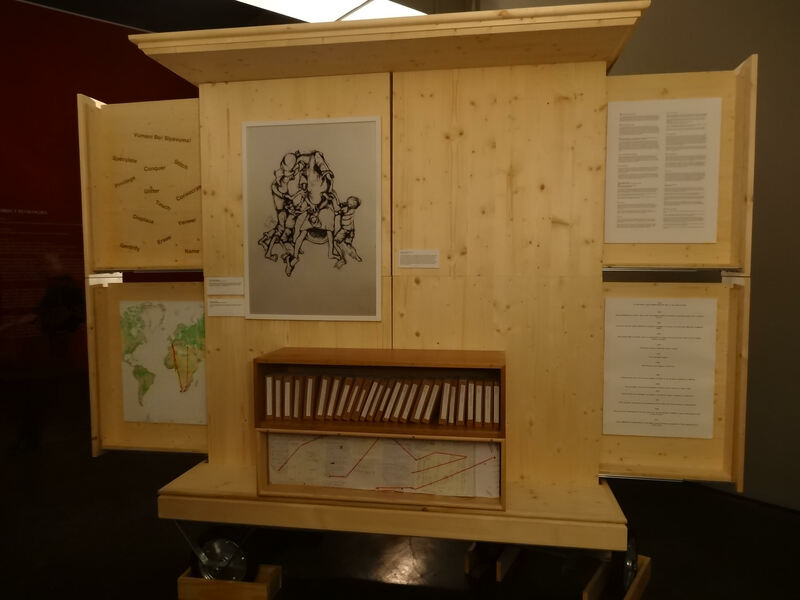 The considered context in which he operates spatially is socio-economically charged, though, speaking to the privilege the artist enjoys as a flâneur, free to consider and respond to views from his studio. These views change rapidly and ironically reveal a disadvantage of the ‘dawn of a new era’: gentrification. Reflecting Legacies: Why an Africasso Collection? Besides the dualisms that Views from the Studio contemporaneously inhabits, the vessel also alerts one to an interesting yet apt intertextual reference to the work of Pablo Picasso. Apt because Picasso, like Dyalvane, grapples with the binaries of tradition and modernity in his work, especially in capturing the ennui of modernisation (as seen in aesthetic movements such as Cubism). As art historians (such as Mark Antliff and Patricia Leighten) have argued, Cubism, much like many other 20th century modernist art movements, appropriated, fetishised and romanticised assumed African aesthetics that conceptualised harmful stereotypes such as ‘primitivism’. The aim of such movements is to counter what Picasso and his contemporaries perceived as Europe’s (Western culture) overly progressive civilisation, which was in need of rejuvenation through contact with societies in the heart of darkness (Africa). I undertook a residency at the Palo Alto Art Centre in Palo Alto, California, a first for them in accepting an international artist in residence … Exploring as a human being is so very important in learning. As an artist my scope is an entire world filled with connections to be made, which gives rise to stories sculpted by experience and history to be shared. This is why I enjoy residencies. Dyalvane’s intertextual Picasso motifs can be read as a subversion of the affinities the Spanish artist had with Africa: one of a timeless culture free from progress and industrialisation. In creating work with such fluidity and diasporic movement, Dyalvane complicates the relationship modern artists have with Africa and its art – relationships that continue to manifest beyond the ideological framework that premised these colonially motivated understandings of the continent. As a Picasso aficionado, Dyalvane disrupts not only the harmful assumptions of primitivism but also the notion of progress – showing that one can exist in both the traditional and the urban without preferencing one over the other. This is especially relevant in the context of Picasso’s modernist aesthetic sensibilities, because in 19th century Euro-American life, social critics opposed the shift toward modernity and urban life. Antliff and Leighten (2003) note that influential writers like John Rushkin viewed the migration from the country to the city as a loss of the ‘traditional’ life of Western culture pre industrialisation. ‘Primitive’ societies, with their supposed communitarian values, served up juxtaposed and ironic inspirations for modern artists disaffected with the status quo. Figure 3: Screenshot of Imiso Ceramics Africasso Collection inspired by Picasso. Imiso Ceramics. One can take Dyalvane’s practice a step further by threading his twofold thematic current in Views and his financially successful artistic practice as a kind of artistic gentrification – borrowed from an op-ed by art historian Chika Okeke-Agulu titled Modern African Art Is Being Gentrified – consolidated by the commercialisation of African aesthetics. Dyalvane does not seem oblivious to those same demands of gentrification in the spatial context of Woodstock. In depicting a fluid merger of rural and contemporary life, Views speaks to the precariousness of progress, especially in the symbolic offering of the liminality of Dyalvane’s aerial observations of a city in constant flux. This View, much like many of the Views in Imiso Ceramics’ collection, reflects on the industrialisation inevitable in the politics of gentrification and its socioeconomic implications. Making connections between Views and Dyalvane’s positionality as a successful Black African male artist who appropriates Picasso makes for fascinating readings. 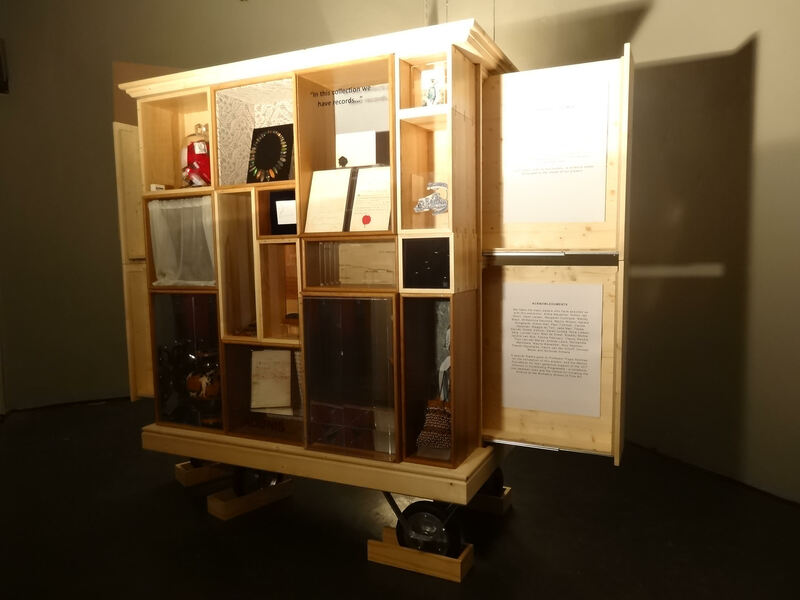 They suggest a postcolonial trajectory for understanding the relevance of culturally significant objects through their symbolic qualities and their curations through time and space. Views from the Studio immediately reflects cultural evolution, but within the limitations of dual realms that may be read as oppositional. Dyalvane makes this coexistence visible by carving pieces that speak to what author Tapiwa Matsinde (2015) calls ‘global savviness with local flavour’, creatively reviving African traditions through artistic sensibilities. Figure 4: Andile Dyalvane overlooking the views from his Woodstock studio. 2011. Photograph by ThinkPhotograph/thinkphotograph.blogspot.com. Antliff, M. & P. Leighten. 2003. Primitive. In Critical Terms for Art History (2nd edition), edited by R. S. Nelson and R. Schiff. Chicago: University of Chicago Press. Cotterell, G. 2017. Meet the Maker: Andile Dyalvane at Imiso Ceramics. Business Day Wanted. Available: https://www.wantedonline.co.za/art-design/2017-03-06-meet-the-maker-andile-dyalvane-at-imiso-ceramics/ . Fabian, Johanness. 1983. Time and the Other: How Anthropology Makes its Object. New York: Columbia University Press. Imiso Ceramics. Available: https://www.imisoceramics.co.za/index.html . Matsinde, T. 2015. Contemporary Design Africa. New York: Thames & Hudson. Perrill, E. and W. Gers. 2016. 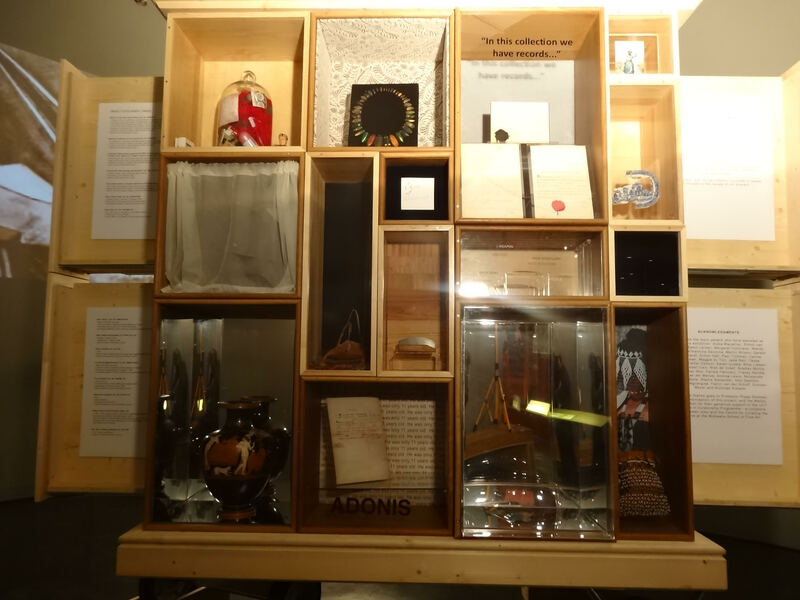 Ceramic Displays, African Voices: Introduction. Interpreting Ceramics 17. Available: http://search.proquest.com/docview/2037440553/ [7 September, 2018]. Fabian, Johanness. 1983. Time and the Other. How Anthropology Makes Its Object. New York: Columbia University Press.